Have you ever seen a comics wedding seating plan? The wedding table plan has now become part of the spouses’ agenda. More than a sort of decoration, the wedding seating chart defines the theme of marriage. The size of a table seating plan is usually 100×70 cm (27.8″x39.4″), made on cardboard or parchment, and are supported by an easel or sometimes framed, with a themed drawings inside and the names of the guests grouped together for tables. The comic themed wedding seating chart is an original choice. The table plan becomes a sort of comic story or comic illustration, which captures the attention of the guests for its particularity. You can get a comic wedding table plan with each panel dedicated to a funny cartoon character and the names of the guests in the balloons, or a single illustration with various characters: there are many choices. The wedding seating chart will feature the typical scenario of the funny comic character you’ve chosen, to reproduce the classic setting of the stories. We will decide together the best table arrangement for your comic wedding seating plan, to give space both to the drawings and to the guests. 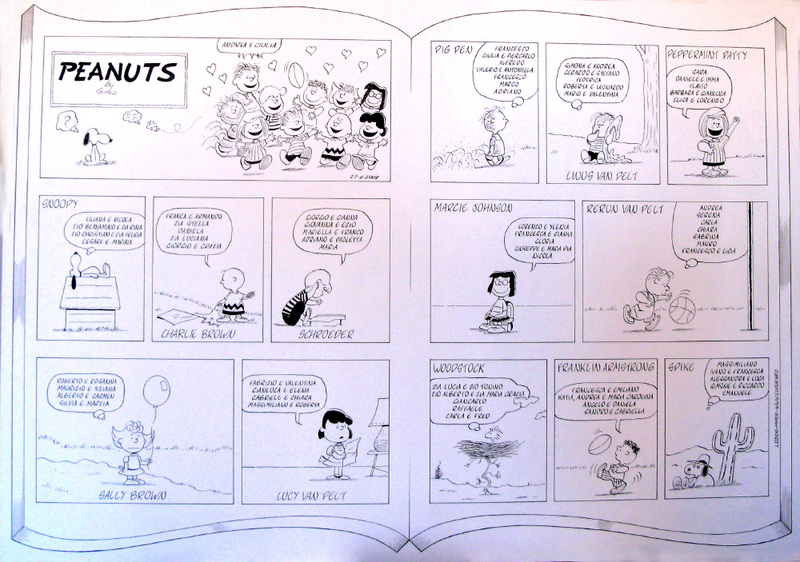 This is a comics wedding seating plan made on cardboard with the Peanuts comic strips.